The Redwoods Winery was bonded in the 1930’s, the fifth bonded winery in Oregon. The name comes from the four giant redwood trees planted in Milwaukie, Oregon in the 1880’s. In the late 1800’s John F. Broetje left Illinois and settled in “Little America”, now known as Milwaukie. For years he made wine from Concord grapes harvested from cuttings brought from Illinois. Broetje was among the first to plant Labrusca grapes in the west. Following Prohibition John Broetje’s son carried on until his death in 1943. Then Miss Dora Broetje, daughter of John, resumed making wine until the early 1960’s. By then in her early 80’s, Miss Broetje decided to give up winemaking and retire. 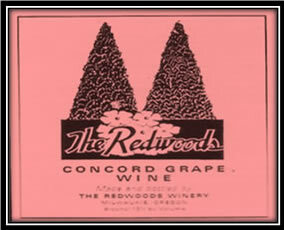 The Redwoods made Concord wine and also raspberry, honey, cherry, and rhubarb wines. The Redwoods was located in Milwaukie, Oregon.